My favourite meal of the day is breakfast. And get this, I enjoy it even if it’s Weetbix. It is a meal with so much promise. 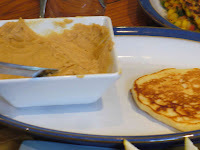 It’s the start of the day, there are infinite possibilities – smoothies, cereals, oaty goodness in its many forms – muesli, bircher muesli, granola, porridge, pancakes, eggs, bacon, roasted … Continue reading "Pancakes with maple butter"